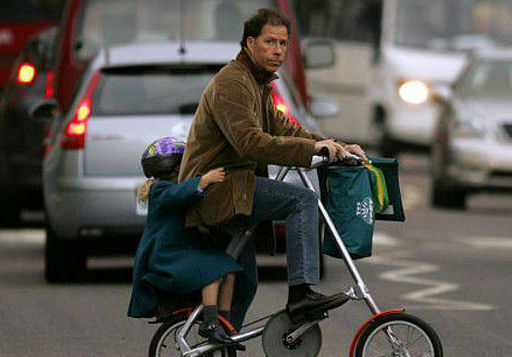 The Queen's nephew Lord Linley refused to apologise yesterday after he was photographed pedalling along King's Road in Chelsea with his four-year-old daughter perched precariously on the rack of his folding bicycle. The Hon Margarita Armstrong-Jones, who is 14th in line to the throne, was pictured wearing a safety helmet, grasping hold of her father's coat, her face buried in his back and her legs dangling over the rear wheel. Lord Linley, the son of Princess Margaret, was balancing his daughter's schoolbags on the handlebars as he negotiated the rush-hour traffic. If she was secured in a humvee and menacing cyclists this wouldn't be a story of course, but while we encourage ditching the car for a bike it's still not a good idea to balance your kid in an inappropriate place (there's a Sickipedia gag in there somewhere). The bicycle company said the shelf was designed to carry a light raincoat, not a child. Well, according to David Icke the Royals like nothing better than using small children as light raincoats so maybe Lord Linley wasn't technically in the wrong.